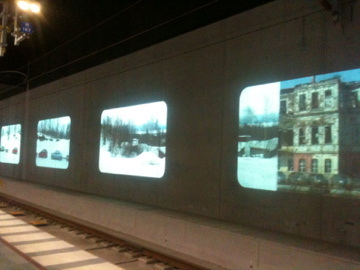 I was lucky to visit Malmö (and the Medea Lab too) to talk about media archaeology just a couple of days ago and on the way back saw this attractive public art projection of remediative proportions. 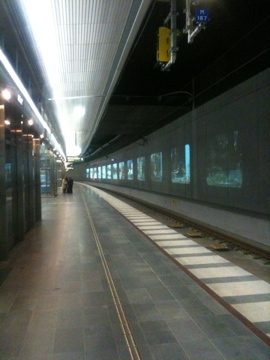 At the Malmö train station platform a projection that imitates the windows of a screen is a nod towards the train passenger’s view as cinematic glimpse into landscapes, people, things passing by, as well as a form of cinematic spectatorship where the projection wall could be seen as stabilized frames – a frozen film, or actually where the frames are frozen but the image magically carries on. As such, the train platform was a great location for this as a small but somehow silently beautiful nod to this historical conjunction between technologies of transport and technologies of vision. How we move (and are moved) is mediatic as well. And thought just to mention that I am writing this post on the train.